Admit it, you still love the Yogi Bear cartoons from the late 1950's. Unlike a real honey-loving bear, this little friend does not require high maintenance. He is ready for play whenever you are. 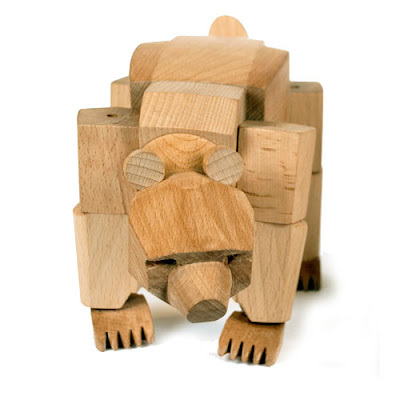 Ursa the Bear is a fun and very unique quality wooden toy. Ursa the Bear was created by Brooklyn-based designer David Weeks. This bear was named Ursa, its name is Latin for 'Bear'. Ursa the Bear is a brave, strong, and curious looking animal. His powerful hardwood frame can hold many poses, and his elastic-band muscles and durable wood limbs make him almost impervious to breakage. Ursa the Bear makes a great unique gift idea for both children and adults.